The Marine Mammal Center aids in a sea lion's escape from Alcatraz! Al Catraz and his buddies Puptart, Hawthorn, CBreeze and Blizzard are now back home in the ocean. Under sunny skies at Point Reyes National Seashore, the five sea lions were greeted by another pinniped already there - a molting elephant seal weaner! The sea lions paid no attention to him though as they explored their surroundings. Al Catraz went out first followed by Puptart; both seemed a little tentative to run directly into the waves, but once they did - they swam off and never looked back! Hawthorn, Blizzard and CBreeze made their way to the water's edge shortly after, lingering for a bit before deciding as a group to make the plunge and dive in! A special thanks to National Park Service ranger John Eleby for helping with the release today and to Stan Jensen, animal care volunteer who helped rescue and release Al Catraz and CBreeze! As of May 1, volunteers and staff from the Center have rescued 232 marine mammals this year. 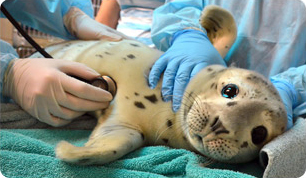 You can help give a seal a meal through our Dollar-a-Pound campaign. Al Catraz is going to his ocean home this week alongside his buddies Puptart and Hawthorn! All three sea lions received their exit medical exams over the weekend and veterinarians feel very optimistic that these animals are ready to return to life in the wild. Volunteers Rescue a Sea Lion Pup Found on the "Rock"
Al Catraz, a young sea lion pup, wards off the chill on a heating pad at The Marine Mammal Center March 22, 2012. Al Catraz appears to be doing well and has even gained 4kg since he first arrived! Veterinarians are cautiously optimistic that he'll become a candidate to be released back to the ocean, possibly in a couple of weeks. They do want to re-examine some nodes on his throat to see if the antibiotics are working efficiently. When he's not eating fish, he spends his days and nights swimming with his new pen mate - another sea lion pup named Puptart. A somewhat unusual rescue at one of the world's most iconic destinations - Alacatraz! A young California sea lion was spotted on a dock on Alcatraz Island in the San Francisco Bay on March 21. A National Park Service ranger on Alcatraz notified the Center and paved the way for our rescuers to use an island commuter ferry to scoop up the little sea lion who was obviously in a bad location and in need of some help. This very malnourished male sea lion pup, now named Al Catraz, is being cared for at our hospital under watchful eyes. Initially weighing 14.6kg (31.9 lb), Al Catraz was too weak to eat on his own, so he received his meals in liquid form for the first couple of days at our hospital. This week, after some TLC and much needed nourishment in the form of electrolytes, he is stronger and is eating nearly four pounds of fish a day on his own. No bread and water for this sea lion! Al Catraz gets a square meal of herring! This is not the first time The Marine Mammal Center has rescued pinnipeds from the Rock. In 1993, we came to the rescue of another young sea lion nicknamed Bird Man and again in 1999 for a sea lion named Fortress. In all, eight sea lions, counting little Al Catraz, have been rescued from Alcatraz Island, proving that escape from the Rock is possible!